Reef Runner Fishing Lures are widely popular, especially on our bay. Reef Runner's crankbaits are designed, tested, handcrafted and painted right here in the USA. Quoted in In Fisherman Magazine as "the envy of luremakers on both sides of the Pacific," all Reef Runner lures feature a premium high gloss chip-proof finish. Along with the standard colors, we carry the custom colors that are often hard to get. These custom color lures are available in five series, 500, 600, 700 and 800. Fish love 'em! Reef Runner Lures are fitted with an exclusive VMC Reverse-barb, Vanadium Cone-cut treble hooksthey "hook 'em and hold 'em!" M. Breiert from Germany bought some Reef Runner lures online from us at Bay Shore Resort Bait and Tackle. 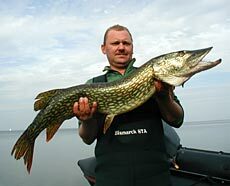 He sent us back a photo of the pike he caught using the lures. Little Ripper(500) - $7.49/ea., Deep Little Ripper(600) - $7.49/ea. Ripstick(700) & Deep Diver(800) - $7.49/ea.